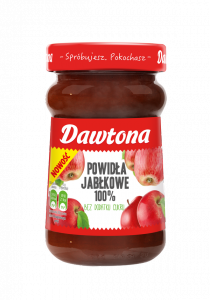 Carefully selected high-quality varieties of extremely juicy and sweet – these are the fruits selected for Dawtona’s new apple jam, prepared with no added sugar, on the basis of traditional recipes. Dense and extremely flavorful; with rich velvety texture. Long-fried and delicate in flavor, this jam owes its natural sweetness only to the fruit. The secret to the unique flavor of the jam lies in using only two ingredients - apples and apple juice. This makes it a product that’s both natural and healthy. 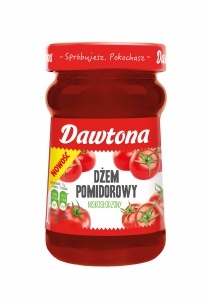 Dawtona’s tomato jam is the perfect addition to many dishes as well as an opportunity to create new and interesting flavors. Thanks to its unique texture, it is great both in the morning - on sandwiches, accompanied by aromatic basil, and in the evening - with tapas, for example a board full of ripened cheeses and cold cuts. It is also an excellent alternative to dips, salsa and ketchup. With the help of our tomato jam, you can prepare savory quiches, cheese muffins and bagels in a matter of minutes. Something delicious for everyone! Plum jam is a great friend to anyone who likes to bake. It can also be used to bring back childhood memories – just smear them over bread and cream cheese! 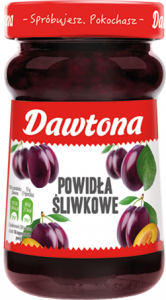 Our plum jam is made with 196 g of fruit per 100 g of finished product and does not contain artificial colorings or preservatives. Slight hint of sour cherry flavor as well as distinct color and texture in combination with yogurt or waffles make for a delicious dessert for the whole family to enjoy. Low sugar, made with 40 g of fruit per 100 g of finished product, no artificial colorings or preservatives. All the sweetness of raspberries, blueberries and blackberries combined in the jar allows to momentarily conjure up flavorful memories of the summer. The richness of forest fruits goes especially well with pancakes, cottage cheese, waffles or ice cream. 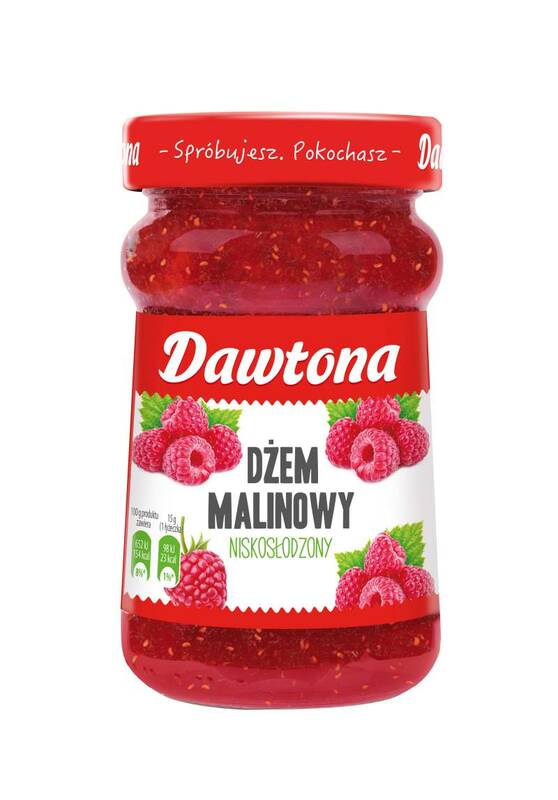 Jam does not contain artificial colors or preservatives. Low sugar, made with 40 g of fruit per 100 g of finished product, no artificial colorings or preservatives. Here’s a jam perfectly suited for toast and pancakes or as an addition to pastries. Low-sugar peach jam contains no artificial colorings or preservatives and is made with 40 g of fruit per 100 g of finished product. The sweet taste of black currant with a slightly sour note and a deep dark color make this jam an excellent addition to pastries, ice cream and other desserts. Low sugar, made with 40 g of fruit per 100 g of finished product, no artificial colorings or preservatives. It is our proposal for breakfast, as well as a great addition to meat and sauces. Add it to creamy yogurt, cottage cheese or crunchy flakes and enjoy a delicious, light breakfast. 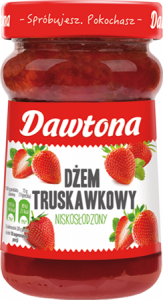 Its pleasant aroma and deliciously delicate taste of juicy strawberries make it a real treat, not just in the morning. Low sugar, made with 40 g of fruit per 100 g of finished product, no artificial colorings or preservatives. It is a perfect, fruity addition to desserts and cakes. 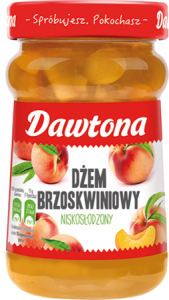 Our velvety apple sauce is packed with juicy apples, the greatest treasure of Polish orchards! It truly melts in your mouth, bringing back the most beautiful memories. Perfect for apple pies, desserts and sweet snacks, including the all-time favorite rice pudding with apple sauce and cinnamon. Product available in 720 g jars.